We’re back with part 2 of Overheard in Product—a series in which we round up all the tantalizing conversations from product folks that you may have missed last week. 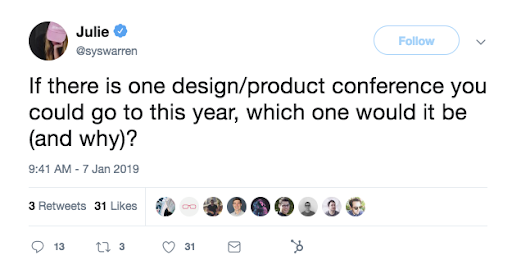 This week, we talk about the best product conferences, what makes a good products, why failure shouldn’t be idealized, bottom-up digital design, and the WILD tricks your eyes are playing on you every moment of every day. First up: Julie Delanoy checked in with her crew about where to spend her conference budget this year. Epicurrence fans came out strong and in front. Speaking of front, Front was mentioned a few times, too. Can I take a pain check? What gives a product that je ne sais quoi? 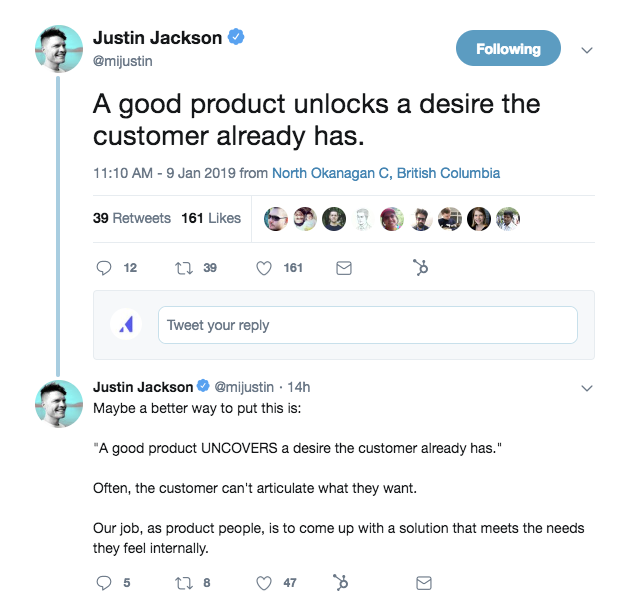 Justin Jackson has a customer-centric approach. Customers might not know how the product will solve it (that’s where you can innovate), but the pain itself should already exist. Lately it seems like everyone is talking about failing often. But should we really embrace failure? Stephen Gates says hold up—don’t say failing when you really mean learning. Folks had mixed responses to this one—but most everyone agreed that failure can evoke a stopping point and that the real work comes from what you do after the failure—err—learning opportunity. 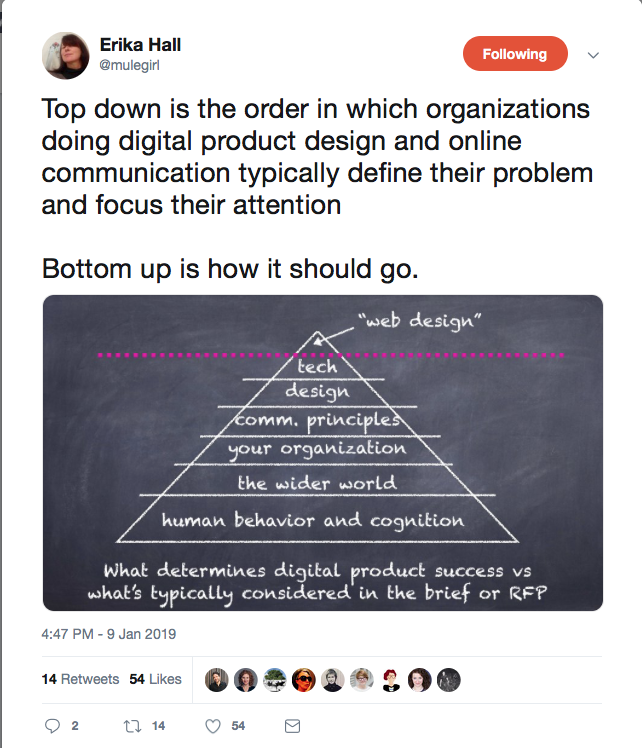 Erika Hall, author of one of my favorite books, Just Enough Research, flips around the conventional digital product design process in this tweet. Success of design is so much bigger than just the web design itself. It’s based on tech, communication principles, your organization, the wider world, and yes, human behavior itself. No pressure. No, I mean, you actually shouldn’t believe your eyes. Because your brain is telling you bald-faced lies all of the time based on your own eyes’ limitations. Case and point, this thread from Foone Turing (which is from last July but just resurfaced in my timeline) is downright fascinating. The TL;DR is that your eyes move in a way that makes your vision worthless for brief moments in time. Haven’t noticed? 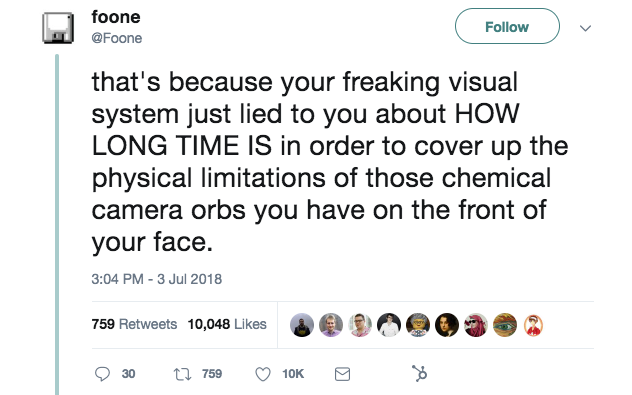 That’s because your brain plays a sneaky little trick on you and bends time itself. And that has all sort of implications for building VR—and you know, the whole trusting your brain thing. If you’re intrigued, you might want to check out this book, Visual Intelligence: How We Create What We See. And if you want to expand on any of these product topics or others by writing for our blog—get in touch. We’d love to chat!